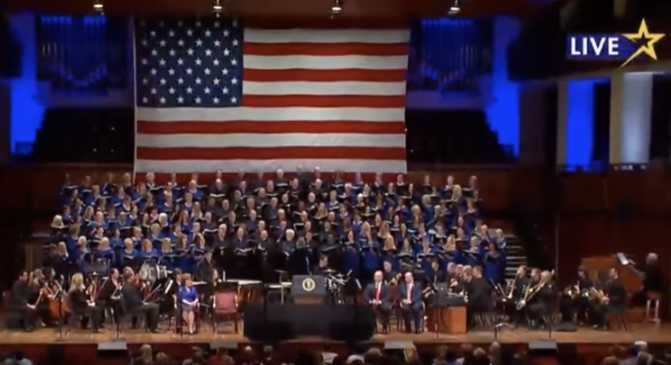 DALLAS, Texas — A Southern Baptist choir sang a song based on President Trump’s “Make America Great Again” campaign slogan during Saturday’s “Celebrate Freedom” rally in the nation’s capital, sponsored in part by the First Baptist Church of Dallas. The song, which is now licensed by the worship music resource group Christian Copyright Licensing International (CCLI) for other churches and religious gatherings to sing, had been written by the church’s former music minister, Gary Moore. Robert Jeffress, leader of First Baptist Church of Dallas, praised the president from stage as being a sign from God that He is not finished with America. However, while the song was received with applause and cheers from those present, some who viewed the video footage of the performance expressed concern. Trump himself spoke to those gathered at the event, acknowledging that the freedoms Americans enjoy come from God and not man. Note: Song begins at approximately 34:30 into the recording.